PCs also halted legislation to strengthen oversight of law enforcement. TORONTO — A number of laws passed by Ontario's previous Liberal government have been put on hold by the newly elected Progressive Conservative regime, including measures to tighten rules around vaping and to cap resale values for sports and concert tickets. A spokesman for the Progressive Conservatives said Wednesday the new government, which was sworn in Friday, wants more time to consult and examine the laws before they come into effect. Simon Jefferies said the government will delay the implementation of new rules around vaping, which would have regulated the activity in much the same way as smoking. "The government will work with the public, experts, and businesses to re-examine the evidence related to vaping as a smoking cessation tool to ensure that any changes are in the best interests of everyone and protect Ontarians' health and safety," he said in a statement. Halting the new regulations will not change the current provisions in the Smoke Free Ontario Act and the Electronic Cigarettes Act, he said. 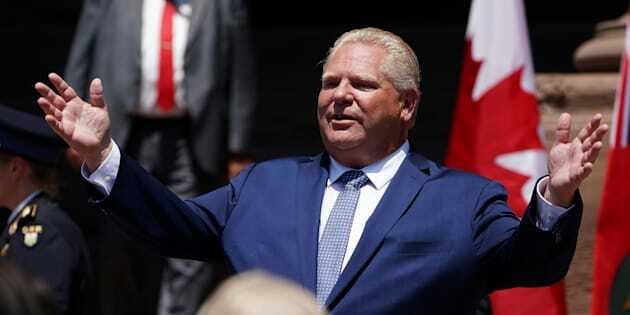 Maria Papaioannoy-Duic, spokeswoman for the Vapor Advocates of Ontario, lauded Premier Doug Ford and new Health Minister Christine Elliott for the move. Vaping advocates have argued that the activity is safer than smoking and moves people from the toxic chemicals found in tobacco to an alternative, which can help them break their habit. "We're excited that the government ... (has) recognized our efforts and have paused the implementation of these regulations," she said in a statement. "We have the utmost confidence that they are going to look at the regulations based on science and not guesswork." The government also confirmed Wednesday it has delayed a law which would have capped sports and concert ticket resale prices at 50 per cent above original face value will not immediately move ahead. "The previous government attempted to institute a cap on ticket resales with no way to enforce that cap, resulting in less consumer protection," Jefferies said. "We have paused the implementation of this section until we can review this provision in full to make sure it is in the best interest of Ontarians." The legislation would have also banned so-called "scalper bots" that buy a large number of tickets online for an event and then resell them at a large profit. The provisions in the new Ticket Sales Act are contained in omnibus consumer protection legislation that also includes strengthening rules around home warranties, real estate practices and travel services in Ontario. The Liberal government passed the bill back in December 2017 and it was set to come into effect on July 1. NDP Leader Andrea Horwath slammed Ford for putting the brakes on the consumer protections. The indefinite delay will mean ticket resellers can continue to "scoop up swaths of tickets and gouge families on their resale", she said. "Doug Ford has taken the side of scalper-bots, helping them to rip off and gouge Ontario families without an end in sight," Horwath said. The Tory government has also halted changes to legislation that strengthen oversight of law enforcement and redefine police officers' duties. The government will now further consult with stakeholders, including police associations who felt the law was rushed. Bill 175, dubbed the Safer Ontario Act, passed in the legislature in March and offers the first updates to the Police Services Act in more than 25 years. The Tory government will also delay changes to immunization reporting rules which Ontario's doctors had argued would burden them with excessive paperwork.